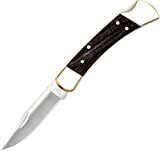 I know my father has a couple Buck Knives stashed away in a sock drawer somewhere, and I wouldn’t be surprised to learn that a majority of American men over the age of 50 are in a similar position. Buck is known for making reliable hunting and outdoor blades, and they have been doing just that for over 100 years. 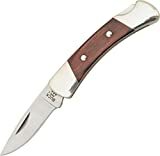 Oddly enough, part of what made Buck so popular then is part of the challenge that Buck and many other classic cutlery companies face today. I’m talking about keeping their products relevant, their designs iconic, and their products in the hands of the consumer. Knife companies want their knives on your belts and in your pockets, not stashed away with Walkman’s, brick-sized cell phones, and other every-day articles of yore. And while the cutlery industry may not have evolved as rapidly as the electronics industry, it has certainly experienced its fair share of change. Things like pocket clips, exotic steels, and one-hand deployment have gone from curiosity to industry standard in a relatively short period of time. And it is also important to note that the US cutlery industry is not without it’s casualties. Long standing companies like Schrade and Camillus have literally gone the way of the dodo. Both companies filed for bankruptcy in the past decade. Their assets were liquidated to satisfy their debts, and rights to their trademarks and designs were sold to the highest bidder. The knives made under these brands today are hollow shells of their former selves with their lineups largely comprised of cheap knives manufactured overseas. But it’s not all doom and gloom. From the ashes phoenix soar to new heights. Plenty of new US knife companies have stepped up to the plate, and Buck is still going strong as they adapt to new market realities. In many ways the Vantage Pro is leading Buck’s charge to both preserve their brand and provide their take on the modern folding knife. The Vantage is made in America, features high end materials, and is priced reasonably. Lets see if this is enough to bring Buck into the 21st century. The Vantage comes in 2 sizes (small and large) and in a variety of trim levels. For the large knife, our overall length is 7-1/2″, our blade length is 3-1/4″, and we have a weight of 4 ounces. The small version weighs 2.3 ounces, has an overall length of 6-1/4″, and sports a 2-3/4″ blade. At 4 ounces I find the large Vantage a little on the chunky side, but find both sizes to be well suited for EDC. As for listing the varying trim levels, well, I figure it’s easier to do this with a chart. Since we have a total of 9 possible configurations here I decided to simply buy the largest, most expensive version, and also the smallest most inexpensive version. So what you are looking at in the photos is a large Vantage Pro and a small Vantage Select. But this is mainly a review of the full size Vantage Pro. The large Pro is the flagship of the series, and is the knife that I was most interested in examining. The blade on the Vantage is a no frills drop point design with a high hollow grind and a nice sweeping belly. Buck selected an adequately thick piece of steel here and I found the tip to be both sturdy and functional. The edge on my Vantage Pro was neatly applied although my less expensive Vantage Select was a little less precise. All in all I like the blade shape – it’s simple and extremely functional. A great choice for an every day carry blade. Per my chart, steel runs the gamut from lowly 420HC to excellent S30V. Given that the prices range from approximately $25 up to $60 I think that is pretty interesting. I was very pleased to learn that the Vantage Pro included a S30V blade. S30V is something you don’t see on a lot of knives in the $50 range (with the Spyderco Native being the only thing that immediately comes to mind), especially $50 knives made in America. If you are contemplating a Vantage, my advice is to spring for at least the “Avid” level Vantage. Sandvik 13C26 will be a substantial improvement over 420HC, which a soft steel that is easy to sharpen, but doesn’t hold it’s edge particularly well. The Vantage features varying grades of handle material over full stainless steel liners. On the full size knife these are thick liners, and I suspect that they add a fair amount to the 4 ounce carry weight. Price permitting, I’d prefer to see them milled out. I like how everything is screwed together, and the clean flow through construction. I found both my knives to be solid, but I did notice that some of edges of the G10 peeked out a little over the liners on my Vantage Pro. All in all this is a well-made handle. In hand the large Vantage is pretty good. The G10 is given a smooth finish, but the handle isn’t slippery. There is plenty of room for a full grip, and the flipper doubles as a small finger choil to prevent forward sliding forward on the blade. The edges of the handle were a little sharp for my taste, but they are reasonable given the intended use. I actually liked the way the small Vantage fit in my hand a little more. It’s a tight fit for larger hands, but the corners aren’t as sharp. The Buck Vantage Pro sports a nice deep carry pocket clip. This clip offers ambidextrous tip up carry, has nice retention, and is very discrete. I like the clip a lot. The Vantage itself is a flat knife and makes for an easy and unobtrusive carry. Deployment is achieved primarily by means of a flipper, although you have the option of using a small oval thumb hole set close to the handle. This thumb hole is blocked somewhat on the left side, so really it’s best used by a righty. For me the easiest way to deploy this knife was by the flipper. I found that the Vantage snapped out crisply with a little wrist action. Buck included phosphor bronze washers to aid in a smooth and reliable deployment. They are small washers, but they get the job done. For lockup the Vantage makes use of a liner lock. Lockup was nice and tight on both of my knives, and I detected no blade play at all. However, I noticed that the lockup was pretty late on my large Vantage, and sometimes it would engage a little earlier, sometimes it would engage a little later. For EDC use I’m not terribly concerned, but I’d like to see Buck iron out this kink. I also wanted to mention blade centering and other matters of fit and finish. When this knife first came out in 2009-2010, there were reports of off-center blades rubbing liners, and tips getting blunted on the backspacer. Buck responded to these issues like champs, both fixing customer’s knives and refining their manufacturing process to avoid future issues. I am pleased to say that I didn’t experience any of these fatal fit and finish issues with my two knives (purchased late 2011). All things considered I feel that the Buck Vantage Pro is a very solid offering. I especially like the price, the high end blade steel, the G10 scales, the attractive design, the nice pocket clip, and seeing “USA” stamped on the blade. Fit and finish isn’t quite 100%, and I think the ergonomics could use some tweaking, but these are relatively minor issues that I can easily overlook when presented with the bigger picture of this knife. What Buck has done here is provide something appealing to the modern knife user without sacrificing the core values that built their business in the first place. It’s so refreshing to see a high quality steel like S30V on a ~$50 knife, let alone a ~$50 USA made knife. I hope Buck will continue along this path of success by continuing to pay attention to the consumer, refining their designs, and releasing more knives that stand out from the pack. In a stormy knife industry Buck has decided to make their own waves – and that’s great news. I recommend purchasing the Vantage Pro at Amazon or BladeHQ. Please consider that buying anything through any of the links on this website helps support BladeReviews.com, and keeps the site going. As always, any and all support is greatly appreciated. Thank you very much.